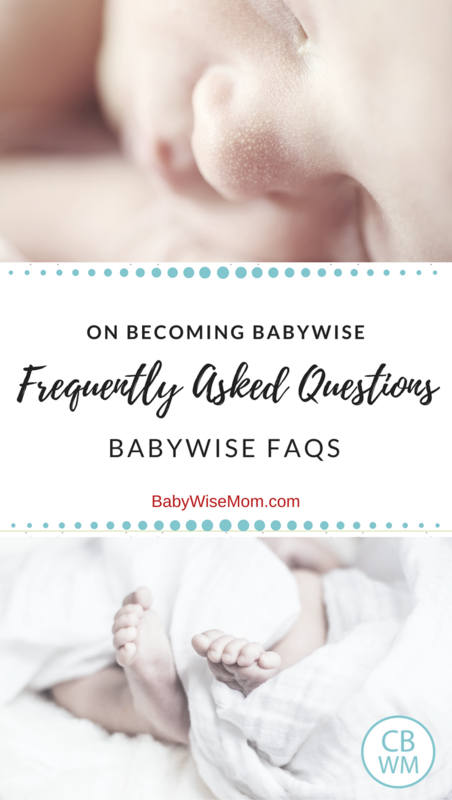 Babywise frequently asked questions. Your Babywise questions answered. Know what to expect with the Babywise method. Most often when we read instructions to something, it seems pretty easy. Making a recipe, putting together a bookcase, parenting…it seems simple enough. We often find, once we get into it, that it is not as simple as it may have seemed. This is especially true in parenting because we add a human factor in there. A baby does not always respond the way you expect her to. A baby is an individual, and you can’t have a book that is written for your exact baby. Because of this, questions come up when people are trying to implement Babywise. Here are some frequently asked questions and their answers. When do feedings and naps change? How do I get my Babywise baby to sleep as long as she should? Sleep. This is a huge driving reason people are attracted to Babywise. They want the great sleep in their lives. They know sleep is an important facet of growth for babies and they know if baby sleeps well, so can the rest of the house. There can be many facets to getting the sleep baby needs. Baby needs to have correct waketime length. Baby needs to be getting enough to eat. The sleep environment needs to be set for success. Baby needs to be healthy and have no medical issues that hinder sleep. Is it okay if baby eats every 3 hours but sometimes wants to eat at 2.5 hours? Absolutely! You can have different intervals all day long. Just make sure you get enough feedings in the 24 hours that she needs for her age. What should I do when my baby wakes up from nap early? If your baby is hungry, you always feed him. If he isn’t hungry, I first try to get baby to go back to sleep. If that doesn’t work, there are a few things you can do. One is get baby up, play for a bit, then put baby back to bed and see if he will finish the nap out. Another is to just feed him and move on with the day. You can have him sleep longer for the next nap if he will to try to get back on schedule. What should I do when my baby wakes up in the morning early but close to normal time? This is such a common problem that I have a post dedicated to this answer. Know that it happens. All four of my children did this for a time as they extended night out but weren’t quite to sleeping through the night status. Read this post for help. 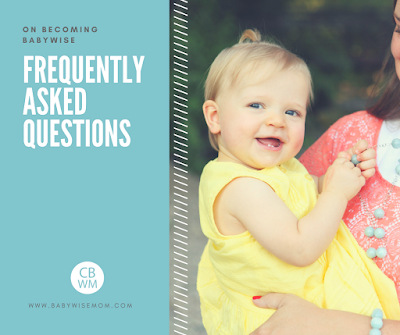 How do I know when my baby can go longer in between feedings? There are several signs. First, be sure your baby is old enough to drop a feeding and eat less often than she is. Second, if you always have to wake your baby up to eat, it might be time. You ideally want your baby sleeping through the night before you feed her less often during the day. When should I drop the dreamfeed? Sleep totals can vary among age groups. I wouldn’t worry that sleep is too much so long as your baby is sleeping well at night, seems alert when awake (barring the newborn age group), and is meeting most milestones at a regular time frame. If you want exact numbers, I send out a freebie on sleep totals when you sign up for my weekly email. One thing to note, babies can sleep a lot more when they are sick. If your baby is lethargic, feverish, or shows other signs of potential issues, be sure to talk to your baby’s doctor about it. In general, with babies, you want a 1.5-2.5 hour nap each time, and night sleep to be 10-12 hours long. Naps should be 1.5-2.5 hours long. Sometimes later in the day naps will only be 30-60 minutes long. Our days are never the same. How do I get more consistency? How do we do Babywise if we can never be home for naps? You need to have some consistency at home if you want the benefits of Babywise. You can’t really follow the tenets of Babywise without offering the sleeps side of things, and it isn’t fair to not really apply it, but be aware of it, and expect to see the results of it. It would be like expecting purple frosting but only adding the red food coloring. You could get some benefit from working toward eating at regular times and trying to get your baby to take some naps on the go. But do not expect full Babywise results without full Babywise effort. How long do we need to stay home for consistency? This will really vary from baby to baby. Some are very flexible while others need extreme consistency in life. This isn’t a Babywise thing, it is a personality thing. Are all sleep props bad? When should I sleep train my baby? As soon as you feel baby is ready. You also need to be ready to sleep train baby. If you are not ready, you will not follow through and baby will not learn how to sleep independently. I highly recommend using the Four S’s for sleep training. You really want to start as close to birth as possible. How do I know how long my baby should be awake in between naps? My baby suddenly learned a new skill. How do I get her to sleep instead of trying to practice in bed? What do I do when my baby is teething and stops sleeping well? What do I do when my baby is sick? When your baby is sick, do what you need to do to help her sleep. Some sick babies want to sleep more than usual. This is okay! Let baby sleep more. Some sick babies won’t sleep unless being held or in a swing or something. This is okay! Some want to just be left alone and in their bed. This is okay! Baby will be able to go back to normal after the sickness is over. How do I travel and still do Babywise? My baby was sleeping so well, but is not anymore. What do I do? How do I get my baby to sleep in later in the morning? I just found out about Babywise. Is it too late for me to start with my child? Help! My baby is 6 weeks old and I’m trying to teach him to fall asleep on his own. I’m doing everything right: following his sleepy cues, setting the environment, placing him down and leaving the room. He can’t fall asleep! I tried for 45 min today. Did the shh/pat method and he cried harder. I picked him up til he was drowsy then placed him down. No luck! How was it so easy for you?! Are you sure you are timing things correctly? It is not uncommon to think you are following a sleep cue but you are really seeing a “too late” cue. I would take notes to really get a picture of things. I took very detailed notes so I could know what was working and what wasn’t.